Welcome to the Juliana Pig Association & Registry (JPAR). JPAR is the internationally recognized registry for the true Juliana pig. The association & registry has been operational since 2009. The goals of this association are to promote the wonderful Juliana breed, register animals to track lineage and to connect customers with screened, ethical breeders of this loving little pig breed. This website offers many features for your convenience. Browse the Breed Standards page to see characteristics of a true Juliana pig. The code of Ethics page details the high standards that JPAR breeder members are held to. 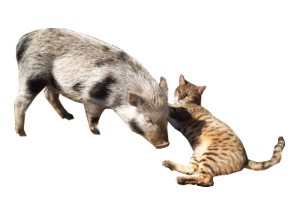 Be sure visit the Litter Announcement page to see who has available piglets or search the Breeder Directory page to find who is expecting future litters. The site also hosts an interactive feature for those wanting to see JPAR registered pigs pedigrees. Click on the Online Pedigree Database link, enter a pigs name and the recorded pedigree info on that pig is yours for review. You can also type in a breeders program name to see all pigs associated with that specific program. Fun and useful information when looking for your new piggy family member! As Juliana pigs grow in popularity there becomes a great need to record pedigrees and register eligible animals. The Juliana Pig Association & Registry (JPAR) will strive to provide this service to purebred and percentage Juliana pigs that meet the written standards. If you are interested in registering your pig please click on the links to the left to learn about the process, forms, and fees. Education is the key to success in breeding or owning a small pet pig. JPAR & our breeder members striver to provide the pig community with the resources it needs to keep our little piggy friends happy and healthy. Please feel free to contact any breeder to answer your questions. Look for additonal ownership resources to be added to the site soon. I am proud to announce that I became registrar of the Juliana Pig Association Registry (JPAR) effective Jan. 1, 2018. I bring my passion for the Juliana breed with me. I have been an active member since the inception of the registry and am proud of how far JPAR has come in it's years of operation. I look forward to continuing to move the Juliana breed and registry forward in the future. Please feel free to contact me if I can assist you in any way. I look forward to great things coming in the future. Go Juliana pigs! !